In 20 years of pioneering work low-carbon expert Mukti Mitchell has shown that cutting your carbon footprint makes you happier, healthier and gives you more joie de vivre. Welcome to his low carbon living resource. Here you will find his guidebook, articles and links to inspire and help you along the way, small happy footstep by small happy footstep! Activities that create CO2 are driving cars, heating homes, flying planes, manufacturing and transport. So in a low carbon lifestyle you live closer to work, insulate your home, take the train on holiday, buy quality products and eat local food. Exercise improves your mood, fresh food improves health and quality products save time and money. If we each reduce our emissions by 4% per year we will achieve 80% cuts in 20 years time. Life then will be similar to today, but we won't waste energy and we will be healthier and happier! 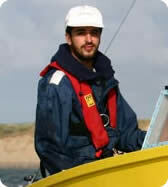 In 2007 Mukti sailed around Britain in a zero-emission microyacht to promote the benefits of low carbon living. Endorsed by the Prince of Wales, Prime Minister and political and environmental leaders, the tour reached an audience of 10 million. This website was originally the platform for the tour and you can read the sailing diary and events list. Sign up to Ecotricity and help the tour - Ecotricity will donate £15 for each new customer who signs up via this tour website. Simply click on this link and switch to renewable energy as well as helping the low carbon lifestyle tour.